At least I don’t live in Boston. We got some sleet, a dusting of snow, and frigid temps overnight. Makes me want to go back to bed under the covers but it’s not Boston! Of course, Saturday was 74, Sunday was 35, and today’s windchill is around zero. Did I mention, BRRRRR! Valentine’s Day was pretty low key for use. Our “present” to each was to hire a guy to rake the leaves in our yard. We’d each down a couple dozen bags through the fall and winter but there was still a bunch. Like 168 bags full. Yes, you read that right. 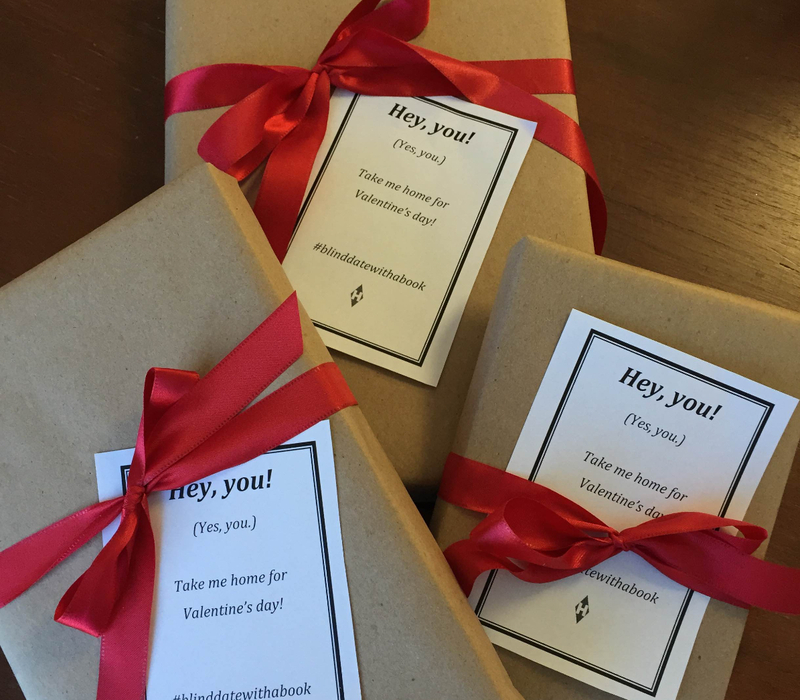 And speaking of Valentine’s Day, Harlequin sponsored the Blind Date With A Book promo. I printed out the “invitations”, wrapped up six of my books just like in the pic and dropped them off at my local Starbucks, Panera Bread, and BJ’s Alehouse, where Lawyer Guy and I had dinner. It was fun. I forgot to tweet and facebook pictures of it but, ah well. Six people got to take a free book home to read. Hopefully, they enjoyed it. I’m still on my In Death reading marathon. OBSESSION IN DEATH came out last Tuesday but I haven’t read it yet. I have six more books and two novellas to go to catch back up to “current” times in the series. I finished TREACHERY IN DEATH yesterday and started NEW YORK TO DALLAS. This time through the whole series, I’ve been trying to make notes on Goodreads as to the major events–both personal (between Dallas and Roarke) and professional for Dallas. There’s the button from NAKED IN DEATH. Summerset’s realization of Eve’s past in IMMORTAL IN DEATH. DIVIDED IN DEATH, when Roarke discovers the truth behind the truth of Eve’s childhood and he puts her needs above his own need for revenge. INNOCENT IN DEATH when Roarke truly hurts Eve for the first time, when his old flame comes to town and plays him. (This is the book where Eve and Summerset actually stand together so Yay!) CONSPIRACY IN DEATH when Dallas loses her badge–and her identity. So many good books! But the two hardest for me to read, and therefore two of my favorites, are TREACHERY IN DEATH involving bad cops and NEW YORK TO DALLAS where the full extent of Eve’s PTSD comes out. Wow. Just…wow. On the writing side of things, I’m about to rap up MOONSTRUCK: SECRETS and get it off to my editor. I still have almost two weeks to get it out more or less on schedule. This entry was posted in Writing Life and tagged books, Monday, Moonstruck, reading, stuff, writing. Bookmark the permalink. Ugh, I wondered if you got dumped upon last night as I watched the band of winter crud making its way east. Here, they can’t decide if we’re going to get 2 inches or 6-10 inches. So far, it’s a dusting, but we ain’t done yet. ValDay was low-key here, too. We didn’t get each other anything and we didn’t do anything out of the ordinary. I love how in love you are with the ‘In Death’ books. How cool is that. Yay for Moonstruck: Secrets! I can’t wait. Thanks again for talking up my book on Friday. That was so awesome. I spent the weekend still wrapped up in Dying Embers stuff. Today, I have to get back to work on something else. Not sure what I’ll publish next, but I’m editing WT until I figure it out, so if nothing else, that one will be ready to go. As for reading, I started my first Mack Bolan book #29 Stony Man, I think. Eye of the Ruby? I picked it and another one up at the thrift store on your suggestion. So far, I’m really enjoying it. 168 Bags, Damn the Leaf Convention must hold their meetings at your house!! Weather has been screwie so hot and colforencisng everbody under the weather. Its now getting cooler and breezy as hell?? Reading front– read Worth the Fall, Worth the Risk by Claudia Connor this is 2nd in the series** she said. she loved your books and what a nice person you were Silver** wish I had been reading her series last year I could have met her in SA. Started and finished Meghan March 1st book “Beneath the Ink” just starting the 2nd “Beneath the Mask” Tonya Burrows 3rd book in her Hornet series comes out next tuesday-Broken Honor–military romance with intense suspense right off the battlefield of Iraq/Afgahn– but i’ll need to read the first 2 to bring me back up to speed!! Mom loved The Death series, and Patricia Crownwall–it helped her when she quit smoking and forensics/medical fasinated her (man close to us was an ME so that added to it. Well hope you guys have a good day–stay warm!! I’m stuck at home thanks to the ice and sleet in Nashville. I actually tried to get to work, but it was too slick. Also couldn’t get back up the hill to my condo, so my car is at my old apt complex and they brought be back home. Now sitting next to my fireplace working on reviews and catching up on a few shows.